I am a member of the Collective Bias® Social Fabric® Community. This shop has been compensated as part of a social shopper insights study for Collective Bias® and Seattle’s Best Coffee #cbias #SocialFabric All coffee obsessions and opinions are my own. I love our Saturday morning breakfasts. With our family members’ different schedules, weekday breakfasts are hurried and no one eats at the same time. On Saturday mornings, I cook a big breakfast and we sit down together for a leisurely breakfast. Somehow we got out of our Saturday morning ritual, Seattle’s Best challenged me to take back my morning and I immediately knew what I wanted to do. My husband has trained the kids to wake him up first on the weekends so I can sleep in a little. (Yes, he’s a great guy.) Recently, they haven’t bothered to wake me up at all on Saturday mornings. If allowed to wake up on my own, I’d probably be in bed until my clock read “PM.” Because of this, there has been no big breakfasts on the weekends. I found the perfect solution that would let me sleep in and still cook a hearty, big breakfast. Of course, there cannot be a proper breakfast without a good cup of coffee. At least not for my husband and I. While everything was cooking, I set the kettle on for coffee. We use a French press to make our coffee since our kitchen counter space is a premium. I think it makes taste better too. I learned about Seattle’s Best coffee from my husband during his Borders bookstore days. As one of the managers there, he was fully trained in the Seattle’s Best Cafe. Since Borders is no more, we have make our own Seattle’s Best at home. The stuffed French toast bake made my morning easier because there wasn’t very much hands on cooking. My 7 year old is the pickiest eater in our family and she asked for seconds! She has even requested that I make the bake again soon. As you can see, there was only one lonely piece of French toast remaining before I had a chance to take close-up photos. I think our family succeeded in taking back our Saturday mornings. 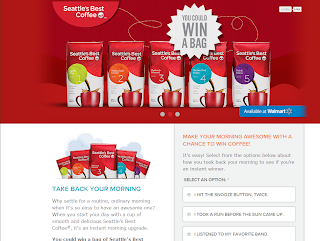 Seattle’s Best wants you to take back your morning too. Just head over and tell Seattle’s Best how you plan on taking back your morning and you’ll have the chance to win a free bag of coffee. Who doesn’t like free coffee? I’m usually a dark roast coffee drinker, but I bought their Level 2 this time around. It’s very smooth, especially with a little milk. I will definitely keep my pantry stocked with Seattle’s Best. Check out my shopping adventures for ingredients for our family breakfast. We even lucked out and found cinnamon swirl bread without the raisins. For some reason, my 7 year old doesn’t like raisins in her food so I was glad to find it. You can use whatever kind of cinnamon bread you want in your bake. How do you plan on taking back your morning? In a medium bowl, combine the first 7 ingredients, making sure to mix in the egg as much as possible. Set aside. Spread the cream cheese thickly on 3 slices of the cinnamon bread. Cover each slice with another plain slice, like you’re making a sandwich. Since my bread was cut thick, I cut each “sandwich” in half on the diagonal. Place them in a small baking or casserole dish, without overlapping them. Pour the egg and milk mixture over the bread, making sure to coat them evenly. Cover with foil and set in the fridge over night. In the morning, preheat the oven to 350F. Bake with foil on for about 30 minutes. Remove foil and bake for another 15 minutes. Let cool slightly before serving. Serve with whipped cream, syrup and /or fruit.